Sea Grove is a lovely Key West style neighborhood reminiscent of the traditional Florida carefree beach lifestyle. Resting on approximately 1,200 acres that include saltwater marshes and tidal creeks, you will find 283 single family homes with quaint front porches, 40 luxury condominiums with one car garages, and a few vacant lots waiting for their new homes to be built. The community also boasts a town center with 65,000 sq. ft. of retail space, a bank, a public library, a post office, Tim’s Wine Market, Aqua Terra Bistro, London Looks Hair Design, Happy Cakes Bakery, Smoothie Fresh, and other businesses including St. Augustine’s Berkshire Hathaway HomeServices Florida Network Realty. Built in the mid 2000’s, this neighborhood is known for it’s coastal feel, proximity to the beaches and downtown St. Augustine, and everything on Anastasia Island. SeaGrove’s community green space, with its stately oaks, is a wonderful gathering spot for picnics or play. The community swimming pool with it’s lovely pavilion and boardwalk are a great everyday escape where friends and neighbors meet for fellowship and fun! The boat ramp, fishing lake, saltwater marshes, tidal creeks and various lakes throughout the community offer relaxing and spectacular views and embody the effortless blend of daily life with nature. 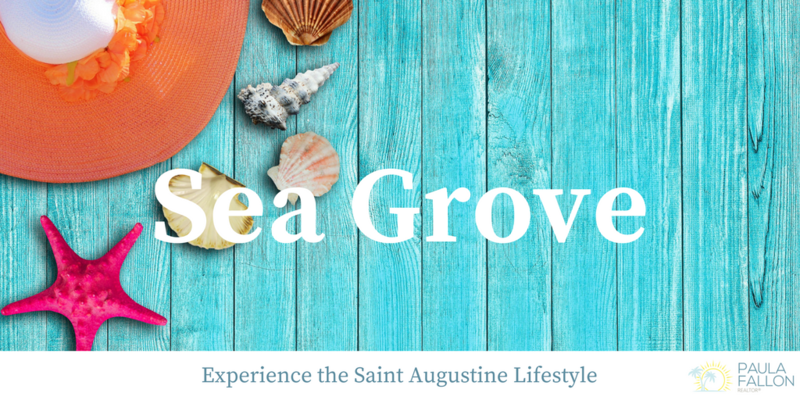 If you are looking for a carefree Florida lifestyle, you will find it here in the beautiful community of SeaGrove on Anastasia Island! Click here to see condos for sale in SeaGrove. Contact me today for more information or a private tour of the homes available.